Carla Rossi was born in 1985 in Córdoba, Argentina. She grew up in a working-class family in a neighborhood called Jardín del Pilar. As the youngest child with four older brothers, she showed great sensitivity to music, literature, dancing and singing since she was very little. Those interests were part of the family’s “language” and it is still part of her. She feels a great affection for her grandparents and believes that they were an important influence on her life. Her grandmother used to sing in a local radio program and her grandfather was a harmonica player. Carla’s first contact with music was through the guitar, but it wasn’t until she was eighteen that she discovered the harmonica, the instrument in which she finds her highest self-expression. The first harmonica players whom she takes as references are Pablo “Tio Paul” Gómez and Luis Robinson, a former player in “Pappo’s Blues” and “La Mississippi Blues Band”. They taught her the basis of blues, strengthened her self-confidence and motivated her to start her own way in music. In 2007, Carla took part in the recording of “Larutanatural”, an album of the band, “Muñeca Plana.” After that, she participated in several bands spanning diverse musical genres. She also studied musical theory, audio-perception, harmony and modal theory with different teachers in Argentina. That intellectual growth enabled her to completely submerge into the jazz world, Argentinean traditional music and fusions of different types of Latin-American rhythms, including rhythmical characteristics, shapes, tradition and innovations as well. In 2014 she moved to Colón, a small beautiful city situated on the coast of the Uruguay River which also borders the Uruguayan city of Paysandú. There, she started working professionally by conducting classes at music institutes and cultural centers. Carla’s talent, sense of cooperation and friendliness finally crosses the country’s borders. She established a local music circuit based on the brotherhood among Argentinean and Uruguayan artists. Along her career she has been part of various music projects and participates as a guest artist in rock and traditional music band’s recording sessions and shows. She also shares the stage with great national and international musicians from the blues and jazz scenes. Such as: “Botafogo” Villanova, Luis Robinson, Carlos Eliot Jr., JAF, Guillermo Romero, Hernán Jacinto and Guillermo Callero, among others. She is the founding member of “Che Jam,” a music series that offers weekly presentations in Colón. Several talented musicians have performed in this series. In the year 2016, she was grateful to be invited to become part of Lee Oskar Harmonicas Argentinean team. This brings her great happiness for the recognition of her work, but it also opens many other doors in connection with the professional music world. She works with other harmonica players and has met Lee in person during his visit to Argentina, as well as playing for the opening of one of his shows in Buenos Aires. In early 2017, she met Ruben Vaneske, a former La Mississippi harmonica player and LOH player. They start working on “Siembra Blues,” which is a collective network of blues and root music musicians. This project fosters art as a means of expressing freedom and creativity, and contributes to self-managed cultural movements and environmental consciousness. Carla also works with Matías Hernandez, a Uruguayan guitar player. They started the “Rossi-Hernandez Duo” in 2015, and are currently recording their first album. It has an instrumental-acoustic format which combines the harmonica and the guitar in an original fusion of international and local music. She also plays in “La Chicago” a renowned rock & blues band from Basavilbaso, Entre Rios. As a result of her hard work, she was also invited to participate in the 2017 Harmonica International Festival held in Buenos Aires (Argentina) and in the Harmonica International Festival held in Montevideo (Uruguay) alongside the main players of the instrument. Besides, she has been the organizer of the first Argentinean Harmonica’s Festival in Colón, where many important music figures from the country have played. Today, she is an important harmonica player in her country and South America. She is a true artist recognized for her constant search and study. 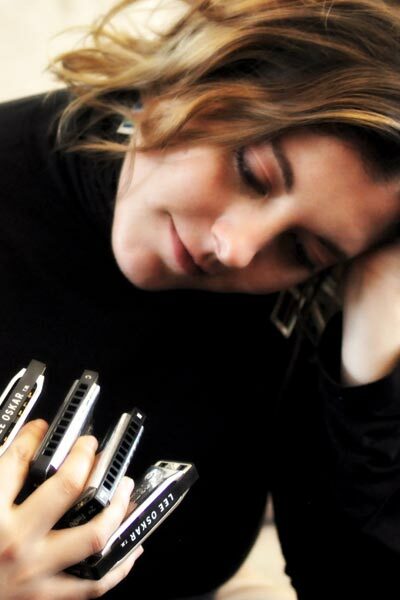 Her love for the harmonica takes her through countless ways where curiosity for new sounds and timbres have no limits. Beyond any doubt, Carla is a harmonica player who still has much more to give.